We often think of chiropractic care in terms of help with pain and injury from car accidents, falls, and sports, and the like, but have you ever challenged yourself to think of chiropractic care in terms of general health and wellness? When your spine is aligned, and alignment is maintained, your nerves are communicating at their highest level, helping your body to work at its peak performance and heal itself. Absolutely, chiropractic care helps with the above-mentioned issues, along with common headaches, neck pain, and back pain, but chiropractic care, along with other support treatments such as stretching, can actually help with numerous other ordinary and not-so-ordinary ailments and conditions that may not be directly related to pain. Things like mobility and strengthening our immune system to arthritis and joint stiffness–allergies and stomach issues to ear infections, and even bed wetting. According to “Huffington Post Canada Living,” chiropractic care also assists with migraines, dysfunctional muscles from Cerebral Palsy, misalignments from symptoms of Parkinson’s Disease, high blood pressure, cancer pain relief, Carpal Tunnel Syndrome, and the reduction of basic anxiety and depression. If you take a moment to think about it, what might be ailing you? Hopefully, you have not been in a recent car accident and you are not in any kind of intense pain, but you don’t have to be in pain in order to feel better. Do you have existing ailments and ongoing conditions you would like to see get better? Are you tired of lacking energy? Would like to have long-lasting mobility? Again, the point is that you don’t have to be in pain to feel better. Quality of life is key–now, and in the future. 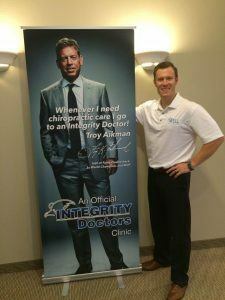 At The Well Chiropractic Clinic, we believe in our motto–Live Well, Be Well, Age Well. Chiropractic care, along with exercise, eating right, the proper rest, and more, is a valid and viable care program for many every day, common health-related problems. Our first visit is a comprehensive meeting with me, Dr. Garst, including consultation, analysis, and findings in order to help move your overall health in the right direction. Don’t be afraid to challenge yourself about considering chiropractic care for general health. Don’t be afraid to challenge yourself to feel better! We can help!